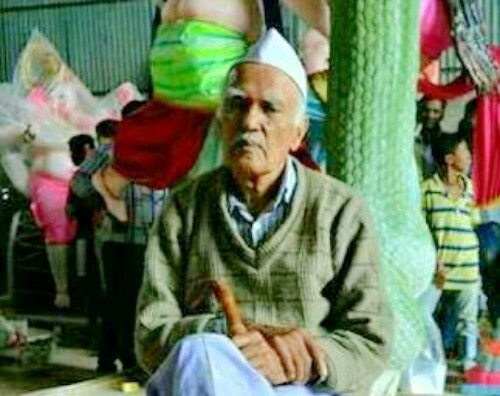 Belagavi’s senior Sculptor artist Jyotiba Jayram Patil (90) passed away early morning after a brief illness. He had become synonymous with making of Ganesh Idols, people used to come from far off places to get their Ganesh idol made from JJ Patil. He was survived by wife, three sons, a daughter, daughter in laws, grand children. At the age of 13 he made his hobby of sculpting into his profession and then for the rest of his life he spent sculpting beautiful Ganesh idols of various sizes and creative postures. He was also very good at sculpting on wood, Clay modeling, oil Paintings. JJ used to make about 80 Big Ganesh idols and about 800 small idols for Ganeshotvsava.